Hadley St. Clair's life changed the day she came home to a front door covered in slips of paper, each of them revealing the ugly truth about her father. Now as her family falls apart in the wake of his year-long affair, Hadley wants everyone-her dad most of all-to leave her alone. Then she meets Sam Bennett, a cute new boy who inexplicably "feels like home" to Hadley. Hadley and Sam's connection is undeniable, but Sam has a secret about his family that could ruin everything. Okay this book should come with a pack of tissues because oh my gosh that was intense! 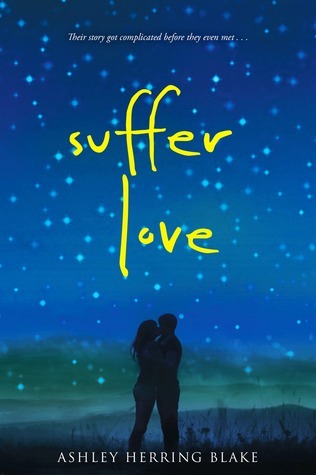 Suffer Love is this crazy story about two people who, thanks to fate or destiny or whatever word you have for it, meet and from the early moments when they first meet, have an inexplicable connection to each other that neither of them understands. But it’s not a totally cheesy, love-at-first-sight story kind of story, it’s so much more. Things change when Sam, one of our protagonists, realizes that this girl isn't just any girl, he, unknown to her, has a history with this girl that's more complicated and twisted than anything else and is the root of both of their messed up home lives. Hadley, our other protagonist, is the girl. She's living day to day in a dazed routine that holds nothing for her except a bleak future that stems from a day in April that turned her world upside down. This book grabbed me from the first page and didn't let me go until I was a sobbing mess of tears and runny nose by the time I closed the book 5 hours after starting it. I can say with all certainty that this just ended up in my list of top ten favorite contemporaries of all time. It was a heart wrenching story about love and heartbreak, both the romantic and familial type, which was so realistic it made me think about my own life and the way I've similarly dealt with events that happened years ago. It's the kind of book that tells the story of picking up broken pieces and trying to fit them back together and making them at least resemble what they were before they shattered. The end both leaves you wanting more but also satisfied that maybe, just maybe, things are going to work out and that there is after all, light at the end of the tunnel.